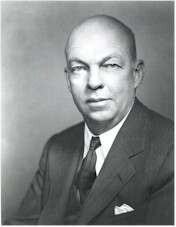 Edwin Howard Armstrong became interested in radio when he was only 13 years old. It all started when he read the Boy's Book of Inventors and he became fascinated with wireless. He was so fascinated he built a 125 foot transmitter in his backyard when he was still a teenager. He experimented with DeForest's audion tube and eventually learned how it worked. He discovered that it was possible for the audion to transmit and receive. This discovery, he called it regeneration, gained much attention from David Sarnoff and the Marconi Company and gave him a name in the radio world. Armstrong was also responsible for creating the first portable radio. The nation had never dreamed that radio would become so accessable. Today we enjoy listening to the radio in cars, while jogging, and on the beach; Armstrong made this all possible. Armstrong's most important invention is that of the frequency modulation, also known as FM radio. FM radio was such an important discovery because it eliminated the incessant static that was synonymous with radio. FM radio allowed listeners to enjoy the music without having to content with static. Armstrong made this discovery on his own initiative after being turned down by businesses who didn't want an FM radio because it would mean scrapping millions of AM receivers. He built his own FM tower to broadcast from and named "The Yankee Network." Even though the Yankee Network itself is no longer around, FM radio has become a permanent fixture in American lives. 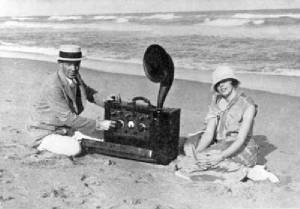 Armstrong presented his new wife with the first portable radio as a wedding present.